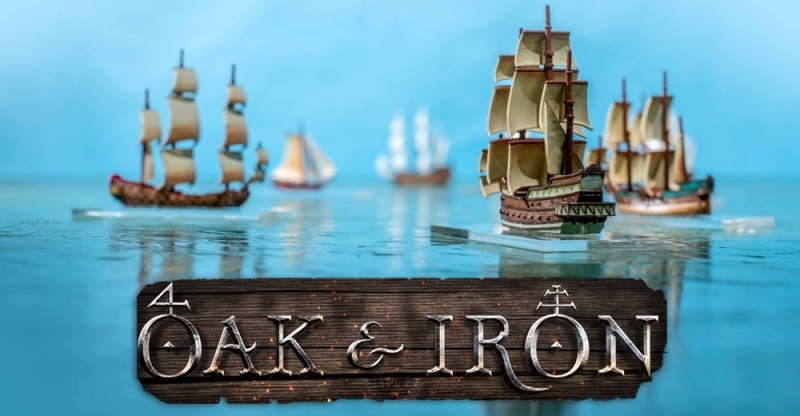 Oak & Iron smashed through a number of its Kickstarter goals during the first day of its campaign. 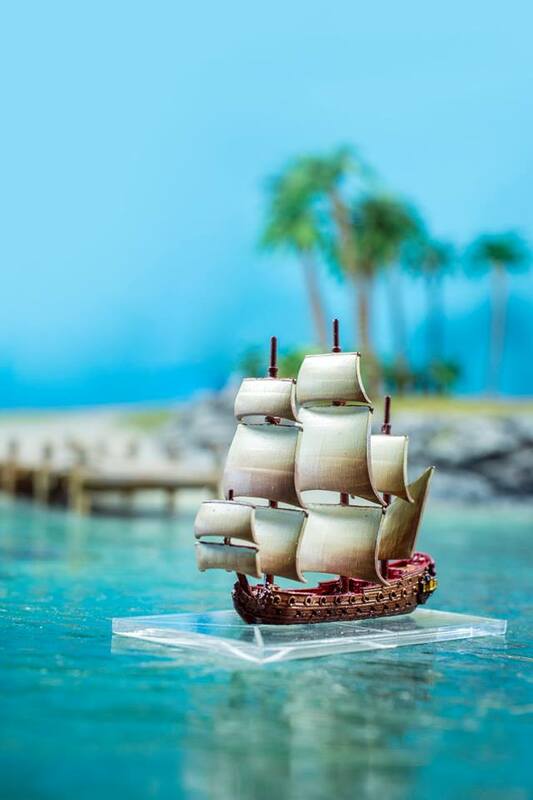 This 1/600 scale naval miniatures game takes place during the golden age of pirates. Made by Firelock Games, this looks like a product to be excited about. If you think you have heard of Firelock Games before, you may have. They also make a 32mm pirate game called Blood & Plunder focused on naval ships during the same era. Yes, the two games take place in the same setting. As such, Firelock Games is talking about creating rules for crossover battles where what you do in one game can effect what happens in the other if you run both games. How cool is that!!! This post is a quick look at the Kickstarter Campaign. All images within this post are from Firelock Games. There are a number of pludge levels. The basic $1 gets you just a thank you. $69 gets you the core box set. $149 will get you the two expansions and the core set (giving you all the ships of the game). The $339 level will get you all of the ships twice over plus two sets of acrylic rulers special to Oak & Iron. 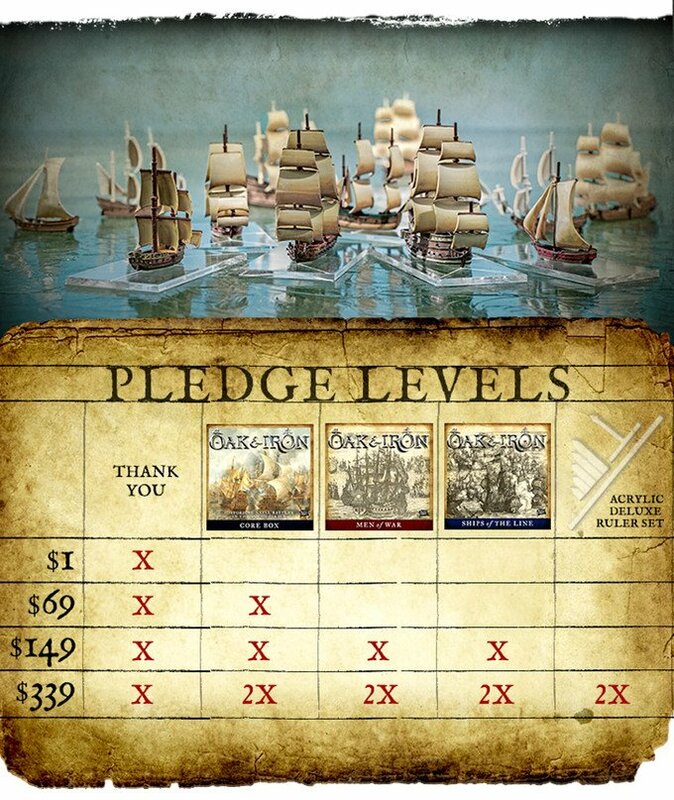 This image shows the various pledge levels you can go in at on this Kickstarter. This image shows what is in the core box for Oak & Iron. The first two expansions include larger ships of war. Two additional expansions have been added to the campaign recently to allow backers to buy more ships out of the core set. One expansion is based on Merchants and the other on Privateers, Pirate Hunters and Militias. If you want a closer look of the images above, be sure to check out the Kickstarter Page. This is a game that I am watching with eager anticipation. I anticipate that you will see a few more posts about this game on both Bell of Lost Souls and Must Contain Minis. If you want more posts about Firelock Games, Must Contain Minis has a section of their website dedicated to posts featuring products from just that company. We are also working on compiling a list of all Miniature Gaming Conventions in Ontario (Canada). If you are in Ontario, this list should be of interest to you!